V.P. Nandakumar MD & CEO Manappuram Finance Ltd. Letters and feedbacks poured to my email after the May edition of Unique Times hit the market; Some feedbacks, some suggestions, lot more of positive reviews and appreciation. I want to say a big thank you for the overwhelming response. The cover story on The Pursuit of Happiness was well received among our readers. Our Health and Beauty pages are also very popular. 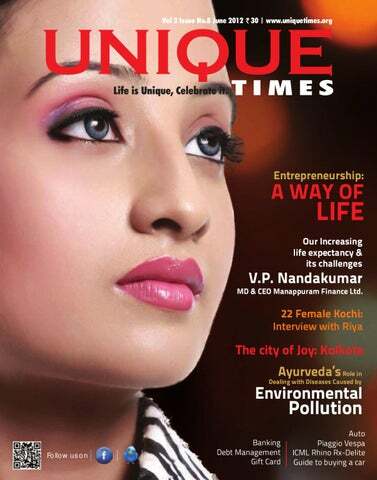 This edition we have a feature on entrepreneurship as the main story. Entrepreneurship has been the hope for any economy and it is some excellent minds that made our lives easier and created wealth. If you are an entrepreneur or want to become one this article is a must read for you. Two articles I would suggest reading is the one on Debt management and the review of Vespa scooter. Debt management is a crucial for everyone, even if you are not in a crisis; Vespa has come back to the Indian market for the third time with a bang. Our online edition uniquetimes.org has seen a surge in visits. We have also made the previous editions available on our website, in case you have missed one. We are in the process of developing applications for Unique Times on Android and Ios platforms; the link to our Android application is already available on our Facebook page. Enjoy your reading and send me your feedback. A quick read on what is happen all over the world, interesting news collected from different sources and based on different subjects. Successful Debt Management an article which will help you in your financial planning. See how can you plan your finances and come out of your debt. A perfect gifting Solution. Jiz P talks about the gift card and how helpful it is. Denisha Sahadevan writes about fatherâ&#x20AC;&#x2122;s day and some ideas to surprise your dear father on his day. Entrepreneurship: A way of Life; Our main story for the month, the article tries to see entrepreneurship in the new age. Entrepreneurship in many ways changed the world economy for good. Vespa has come back to the Indian market for the third time. This time alone, but has brought their classic scooter. Read all you want to know about Vespa. Buying a car is a very difficult process. With a lot of manufactures, models and variants competing against each other, the decision making is very cumbersome. Some techniques you can employ while buying a car. Director Shyamaprasad have always gifted his viewers some extraordinary movies. His latest movie Arike: So close is a simple movie that touches our heart. Our team reviews, the first Malayalam movie to feature in our column. BRD Group manages the Meet and Greet services at Cochin International Airport. Read the innovative idea and the group that manages it. Viadya Vachaspathi N K Padmanabhan Vaidyar talks about Ayurvedaâ&#x20AC;&#x2122;s role in dealing with diseases caused by environmental problems. After a lot of serious reading, some light reading but not that unimportant. A list of some good books that came to our book shelf recently. Some new technology you wanted to know, which can make our life much easier and can change it over the years. There are the good days, when you can find the right outfit easily, and you feel like your on top of the world. New gadgets for the Gadget in you. Samsung Galaxy S III tops the chart everywhere and the hottest launch awaited. This month Sreerekha R Nair takes us through The City of Joy, Kolkata. She has delivered a very tasteful narrative on Kolkata. A must read for all travel lovers. national competition. Rahul Nagvekar from Texas who bagged the first position walked away with a price of US $ 25,000, a lifetime membership to National Geographic society and a trip for two to Galapagos. 13 year Vansh Jain from Wisconsin came second, both are class eight students. The third and the fourth positions went to Varun Mahadevan from San Francisco and Raghav Ranga from Arizona. While Varun, a class seven student got US $10,000 college scholarship. Raghav Ranga who came fourth got a price of US $ 1000. Global investment bank Standard Chartered has predicted that India’s benchmark index BSE Sensex may fall 35 percent in case of Greexit; a word coined to denote Greece’s exit from the Euro. But it is quite unlikely, but in a worst case scenario Sense may fall to 10, 472 levels. Clive McDonnell, the analyst at Standard Chartered arrived at this figure by taking the 2008 price to earnings ratio low and cutting the 12- month forward earnings per share growth by 50 %. Making things worse are an expensive oil and a falling Indian rupee. Oil prices have risen 14 percentage this year and rupee has fallen more than seven percentage. Indian stock market is dependent on foreign funds and foreign investments are on negative growth with $ 545 million outflow in April 2012 alone. Naveen Patnaik has cancelled a seminar he was scheduled to deliver at the Sussex University on Monday. Right wing groups claimed that he changed his programme fearing demonstrations against him. Patnaik who was elected as the Chief Minister of Odisha in 2000 was on his first foreign trip. He was scheduled to give a lecture on the development issues in Odisha at the Brighton-based Institute of D evel opm ent Studi es . An I D S spokesperson IDS told PTI that the seminar has been cancelled due to the Chief Minister changing his schedule on development issues. During his visit to the UK, Patnaik is scheduled to meet officials of the Department for International Development (DFID), which funds several projects in Odisha. He is also scheduled to inaugurate an Odisha handloom show and attend a dinner organised by the Odisha Society in UK. India’s largest private airline Jet Airways said on Friday that it could not complete its sale and lease-back of aircraft in fiscal 2011-12 because European banks are hesitant about lending to Indian carriers after seeing Kingfisher Airlines’ financial woes. This could hamper plans of other domestic airlines, including Jet Airways, who are trying to raise $1 billion in external commercial borrowings after the Indian government allowed such a move in the Union Budget 2012. In a management call with analysts, Jet Airways’ executives said the airline had been looking to raise $200 million from sale and lease-back of 10 to 12 planes in fiscal 2012. However, it was unable to close the deal because European banks did not want to lend to Indian carriers because of what Kingfisher Airlines is going through. Jet will now attempt to complete the sale and leaseback programme in the current fiscal. orders and cancellations were still being processed, according to several sources listening to the call. Those crucial 20 minutes created confusion that turned into chaos over the next few hours as market makers - the brokers who quote bid and offer prices - struggled to figure out what was happening. They were rebuffed in their attempts to get Nasdaq to halt trading and sort out a growing number of problems. As retail petrol price in India reached a new heights , leading car makers Maruti Suzuki, Tata Motors and Hyundai Motor on Thursday announced discounts of up to Rs 50,000 on petrol models for a limited period. While the country's largest car maker Maruti Suzuki has offered a Rs 30,000 discount on its bestselling small car Alto in order to stop falling sales in recent months, rival Tata Motors is giving rebate ranging between Rs 10,000 and Rs 50,000 on the petrol variants of Indica and Indigo family. Hyundai Motor is giving discounts of up to Rs 3,000 on its entire range of petrol models. "Sales of entry level cars are getting affected in recent months due to very high fuel prices. Sales of Alto is falling and to boost sales of the car, we will offer discounts of Rs 30,000 till month-end," Maruti Suzuki India managing executive officer (marketing and sales) Mayank Pareek said. The sales of Alto has come down to a monthly average of about 20,000-22,000 units from 25,000-28,000 units in last fiscal, he added. Pareek said the company is also offering discounts to the tune of Rs 15,000-Rs 20,000 on other petrol models. Talking about a similar step, a Tata Motors spokesperson said: "We are offering discounts on the petrol variants of Indica and Indigo family. Chelsea won the 2011-12 Champions League with a gripping 4-3 win over Bayern Munich on penalty shootout after a 1-1 draw at the Allianz Arena on Saturday. Bayern players was in the Chelsea half for the majority of the match, but were extremely wasteful in front of goal, passing up a number of opportunities that allowed Roberto Di Matteo's men to stay in the contest. Thomas Muller looked to have finally broken their resistance when he scored in the 83rd minute, but Didier Drogba brought the Blues back from the dead with a powerful header two minutes from time to send the final into extra-time. Arjen Robben saw a soft penalty saved by Petr Cech in the 95th minute, but there was no winner in the additional 30 minutes as the match moved into a penalty shoot-out. Chelsea won the coveted for the first time. showcase for Kapoor and the great India siren Nargis (his lover onscreen and off)." "And, of course, it's a musical, whose main song, Awaara Hoon, by the famed Shanker-Jaikishan duo, soared to the top of the pop charts in India, the former USSR and China." Time critic Richard Corliss describes Raj Kapoor as "the great star-of India's postcolonial golden age of movies - Cary Grant and Cecil B. DeMille in one handsome package." "The '50s films he headlined and directed became huge hits not just in his newly freed homeland but also across the Arab crescent from Indonesia to North Africa," Time noted The original All-Time 100 list published in 2005 included Satyajit Ray's The Apu Trilogy, Mani Ratnam's Nayakan and Guru Dutt's Pyaasa. Bollywood composer AR Rahman's score for Mani Ratnam's Roja, the tale of a woman whose lover is kidnapped by terrorists, was also among 10 Best Soundtracks. Last week, Time magazine ranked director Sanjay Leela Bhansali's 2002 film Devdas eighth among the 10 greatest movies of the millennium. the heavy industries ministry is opposing the move. The oil ministry has argued that the additional amount garnered can be used to make good a part of the loss that fuel retailers incur on the sale of diesel at government-controlled rates. "There are two views to the proposal. We are trying to work out a consensus. The Budget has just passed and any changes could take some time," the source added. With the recent hike of over Rs 6.28 per litre in petrol prices, the difference between retail prices of petrol and diesel has widened further. While the per litre diesel price in Delhi is around Rs 40, petrol costs as much as Rs 74.
kidney transplant in 1996. In 1962 Shelby test-drove the AC 260 roadster, the car made with a Ford engine that would become the Shelby Cobra. His company built the first Cobras in Venice, California. Two years later, Ford asked Shelby to develop a high-performance Mustang. 'Whether helping Ford dominate the 1960s racing scene or building some of the most famous Mustangs, his enthusiasm and passion for great automobiles over six decades has truly inspired everyone who worked with him,' said Edsel Ford II, grandson of the No. 2 U.S. automakers founder Henry Ford. His contract with Ford ended in 1970, and he then worked with Chrysler and General Motors Co. In 2001 Shelby was working with Ford again. Shelby is survived by three children and his wife, Cleo. providers from 82 countries and regions to foster trade in the sector for the coming five days. From August 1, 2011, when the rupee was 44.08 to a dollar, the currency weakened to a low of 53.65 by midDecember - a depreciation of nearly 22%. During the same period, Infosys's stock price was almost flat. Marginal gains were seen in other frontline IT stocks. Of late, this scenario has reversed. Since the beginning of March, the rupee has depreciated nearly 12%, from 49.5 to 55.38, but the stock price of Infosys has fallen nearly 17%. "IT spending in the western world has drastically come down. Though Nasscom projects a growth of up to 14%, there are companies that say it's a very ambitious target," said Vijay Gautam, a senior market analyst. Ankita Somani, research analyst at Angel Broking, said that although the rupee's depreciation would add to the revenues of IT companies, "stock prices are unlikely to rally in a volatile business scenario". China is expected to become the world's largest consumer market in 2015.The volume of consumer retail sales will surpass 5 trillion U.S. dollars in 2015 amid an accelerated urbanization rate and the rise of people's incomes, China Commerce Minister Chen said at the opening ceremony of the first Beijing International Fair for Trade in Service. The number of outbound tourists is expected to reach 88 million at that time, he said. Demand for home services, education and training, medical care, financing, technology and tourism is booming, he said. China currently ranks fourth in the world. "This event isn't just a simple door opening between two spacecraft -- it opens the door to a future in which U.S. industry can and will deliver huge benefits for U.S. space exploration," the Space Frontier Foundation, an advocacy group, said in a statement. The world's first commercial space cargo ship, the unmanned Dragon capsule reached the international space staion. Built by commercial company Space Exploration Technologies Corp. The International Space Station's crew reached out today with a robotic arm to grab SpaceX's Dragon cargo capsule and brought it in for the orbital outpost's first-ever hookup with a commercial spaceship. It marks the station's first linkup with a U.S.-made spacecraft since last year's retirement of NASA's space shuttle fleet, and potentially opens the way for dozens of commercial cargo shipments. If the long-range plan unfolds as NASA hopes, U.S. astronauts could be shuttled back and forth on the Dragon or similar spacecraft within just a few years. Space station astronauts floated into the Dragon on Saturday, a day after its heralded arrival as the world's first commercial supply ship. NASA astronaut Donald Pettit, the first one inside the docked capsule, said the Dragon looks like it carries about as much cargo as his pickup truck back home in Houston. It has the smell of a brand new car, he added. "I spent quite a bit of time poking around in here this morning, just looking at the engineering and the layout, and I'm very pleased," Pettit said from the brilliant white compartment. To protect against possible debris, Pettit wore goggles, a mask and a caver's light as he slid open the hatch of the newest addition to the International Space Station. The complex sailed 250 miles above the Tasman Sea, just west of New Zealand, as he and his crewmates made their grand entrance. The atmosphere was clean; no dirt or other particles were floating around. Hong Kong billionaire Li Ka-shing on Friday confirmed that his eldest son will inherit and control his business empire. Eldest son Victor Li has long been expected to take over Cheung Kong Group and Hutchison Whampoa after his father steps aside, so Li's comments to reporters after a shareholders' meeting came as no surprise. Victor has served as the managing director at Cheung Kong - a vast multinational conglomerate with interests ranging from property to telecommunications -- for the past decade. Li senior said that while Victor would eventually take the helm at Cheung Kong, he would "use all his power" to help his younger son, Richard Li, who is chairman of Hong Kong telecoms company PCCW. Li is the richest man in Hong Kong and was named the richest man in Asia by Forbes magazine in March, with a fortune estimated at $22 billion. Successful Debt Management A debt management plan is essentially an informal agreement with your creditors for a lower monthly payment. One of most important concern for individuals and families is rising debt. Debt will take the peace out of the mind unless properly managed. All types of loans are available for an individual from personal loan to home loan, credit card to mortgages; whatever you wish to buy or gain you can do it with a loan. Commercial lending institutions make the process easy for you. Everything is easy but things become difficult when you are not able repay your monthly payments. The importance of the debt management plan becomes important at this situation. A debt management plan is essentially an informal agreement with your creditors for a lower monthly payment. There are two ways of arranging a debt management plan, either through using a professional debt management service or by negotiating with the creditors yourself. Debt Management Plan First of all you will have to draw up a Statement of Affairs. This is the summary of your financial position. List all your assets, liabilities, income and expenditure. Be very genuine in creating the SOA. The next step is to obtain an accurate balance. Get an accurate statement of your outstanding amount. Once the creditors find that your problem is genuine they can restructure the loan for a lower monthly payment. A consolidation loan does not reduce your debt amount, but definitely lowers the cost of servicing your debt thereby increasing your cash flow. will be for future contingencies. If you have something more left, reward yourself with something you need, this will enliven you spirit to stick on to your budget. You will also have transformed the way you are thinking about money. If you are in debt and cannot change the way you spend money you will continue to be in debt. Only when you transform the way you think about money, you can live a life of financial security. Parents must instill financial discipline to children. This will help in the long run. Also important is credit reports, get your credit report and if you have some errors try to rectify it as early as possible. There are legal rights for you as well. Several laws exist to protect you from creditor harassment and abuse. If you feel you have a case against a creditor, you should contact a lawyer to learn your options in detail. As per RBI Guidelines, debt collectors cannot use unfair, deceptive, or abusive practices to collect debt. the gifts , I can do it for you, provided I can carry the same” . My friend said “ You can carry any one or even all of it. All these are of no use to me . Disposing off these is the challenge which I am facing now. Thankfully few marriages coming up these days , where I can gift these unwanted items”. I am sure the situation my friend was is not a unique one. If you have conducted a marriage, a house warming or any other celebration , you might definitely have come across such an unenviable situation. Gifting Solution The most important feature which makes the gift card the most perfect gift is that it provides the recipient the right to choose the gift. Parents are the greatest gifts which God has so dearly blessed us with. And as a dedication to them, there is Mother’s Day which falls on the third Sunday of every May, then there is Father’s Day made to complement Mother’s Day which falls on the third Sunday of every June in most of the countries. For other countries, the celebration to honour mother’s, and father’s may fall on an other day, and time. But as far as India is concerned this year father’s day is on June 17th. Father’s day which was first celebrated in the early 20th century is a day for us, their children to honour, and respect our father showing them how much we truly care, and are thankful for all that they do for us every day. Of course this is something which we should be doing every day. However we have a day to celebrate together, almost worldwide, to show our father a sense of gratitude for just simply being…our father. In other countries father’s day may be celebrated on another day in other ways, like for example in Thailand father’s day is celebrated on the birthday of their present king by giving their father a yellow flower named Canna, and they were yellow to show respect to their king on that day. And in Italy, Father’s Day is celebrated on Saint Joseph’s Day. Whether they are near us or far away, everything that they do is for the sake of their children. From the day which we are born, father’s along with our mother’s dedicate their lives to working so hard to giving us all that which we ask for, and to make our dreams come true, whatever it is that it takes. And so, how can you show them how much you appreciate them? Well here are a few ideas, some very simple, and some may require a bit of money. Starting from the start of father’s day make your father his favorite breakfast, lunch, and dinner…if you don’t know how to cook or are not good at cooking please ask your mother to help you. Get him the morning newspaper, along with his tea or coffee. I am sure any father would surely love that. If you live far away, then go visit your father, and surprise him, it’ll brighten up his day. For those with in-law’s bring your father-in-law’s together, and have a celebration or you can also: -Grab a picture of you, and your father and frame it, doesn’t have to an expensive frame, just simply a frame, along with a greeting card, if you don’t have time to go out, and get one a frame, and a card then make a card. -Get him his favorite movie with his favorite actor, or a soundtrack of his favorite songs bundled in a collection. You can download his favorite collection of songs, and burn it to a CD yourself. -If your father is always on the run, and a busy man, meet up with him, and take him out to lunch at his favorite restaurant, and let the treat be on you for that day. -Wash all his clothes for him, iron it, fold it, and keep it neatly ordered. Trust me this is surely to be appreciated by your father as well as your mother. -Get him a watch, or cologne, get him a nice tie, or a simple t-shirt. If he’s a sports fan get him a t-shirt of his favorite team. Just always keep in mind that it’s the simplest things that matter. You don’t really need to spend money to buy your father’s present’s to make him happy. What matters is that what you do, and say comes from the heart, and that your father knows how much you love him, and appreciate him for all that he’s done for you, and for all the love he’s given you not only on father’s day but every day after that as well so have a Happy Father’s Day! All of which means we don't do a very good job of analyzing things that are important in our lives. exploring who we are and how we might connect to the world of self-employment. It's really no different than analyzing one's career options or choosing a mate. Oh boy, what an analogy; a true one. In reality, 75% of adults don't like their jobs, more than 50% of all marriages end in divorce, and three out of five businesses fail. All of which means we don't do a very good job of analyzing things that are important in our lives. Nevertheless, in business, if we spent half as much time getting ready personally to undertake a venture as we do writing business plans and visiting with attorneys and accountants, we would succeed far more often. The entrepreneur never stops, he never loses his steam, and he is always behind new ideas. A business may fail but an entrepreneur will not. The idea enterprise is quite a large one that one cannot leave mid way. The society cannot accept failures so as family. It is under this pressure the will of the entrepreneur tend to wither out. The will helped move forward entrepreneur will tested against the loving family. Another obstacle will responsibilities, the weight of the responsibility is again a huge factor. Strong minded entrepreneur will surpass obstacles and achieve success because he is born to an entrepreneur . Entrepreneurship is a way of life. There are two widely accepted reasons used to explain why small businesses fail. One is an inadequate understanding of the business; the other is insufficient capital to sustain the venture. Even though those are obvious contributors to failure, I believe there is a much more basic cause of failure; one that is far more powerful and important than knowledge or capital. Just keep in mind as we go forward that any venture can be shoe-stringed financially, and the processes required to run almost any business can be learned. 1. To Be a Successful Entrepreneur you must invent something novel: No take the example of Richard Branson or Dhirubhai Ambani. 2. Entrepreneurs Are Made, Not Born. Entrepreneurial spirit is most often inborn, not that they are created for startups, but certain skills are often inborn. boys were destined to be coalminers. But one teacher Miss Riley (Laura Dern) encourages this dream and enters the boys into a National Science Fair with the prize being a college scholarship. 03. Moneyball (2011) Oakland A's general manager Billy Beane (Brad Pitt) has the lowest salary available for players in Baseball. All of his star players are being picked up by bigger teams and heâ&#x20AC;&#x2122;s left to look at how to create a winning team without the competitive edge that money can buy. The solution is to look at statistical data and pick players based on their stats alone to fill in gaps needed on his team. A true underdog story of a Rocky Balboa (Sylvester Stallone) who is given the chance to fight the Heavyweight Champ. He has a chance to make a better life for himself by going head to head with the competition and winning. 09. Tommy Boy (1995) A family business is on the brinks of going under when the owner passes away. His slow-witted and clumsy son, Tommy (Chris Farley) is left to try to save the company by going out on the road to close sales and keep the company afloat. 10. Flash of Genius (2008) An inventor, Robert Kearns (Greg Kinnear), battles with the US automakers over his device. All the auto giants embrace his invention and it becomes a standard on all cars. However, they do not give Kearns the credit he is due and he fights them for credit. 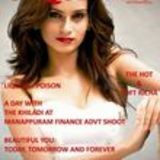 Miss South India 2012 Miss South India is not just another beauty contest. Attracting talents from all over India, it reflects the culture and tradition of India. The pageant showcases South India in all its splendor. prominent name among brand enthusiasts. back to the lucrative Indian market, this time it is fighting it out alone and eyeing at the Lifestyle market. The engine has equipped with modern technologies such as Variable Spark timing management, MAP sensing. segment is growing at a 30% every year. monocoque full steel body construction. a day. Vespa has hold on to the monocoque design right from the very beginning. The link spring mechanism between the engine and frame provides balance and stability. Vespa has designed this scooter chassis which makes the rider confident during sharp turns. makes the new Rhino a formidable package. The new Rhino is proves to be an extremely competitive package not just for the Indian opponents but also for the Japanese, American and European rivals. The fit and finish has been given a lot of improvement. The vehicle is also very solid. vents are provided even at the back side. sure that the vehicle is made for Indian roads. higher end models along with turn indicators on side mirrors. looks like alloys. The dual tone painting is an eye catcher on any road. The red colour is actually metallic which may look like solid red at the first sight. Interiors Sonalika always insist on quality interiors. Guide to buying a new car Selecting a car can be a difficult decision given the numerous models and variants available in the market. There will several questions in the customers mind about the brand, quality, after sales service, price etc. More important is to understand will be suitable for you requirement or not, that includes lifestyle, family size, use etc. 2. Get the information about the cars from the web, brochures; donâ&#x20AC;&#x2122;t look at advertisements alone, because there will only half of the information needed. 3. Select the final set you want to go and experience. 4. Visit the showroom/ ask the dealer for a test drive. 5. Tell them your specific needs and clarify with the executive. 6. If you like the vehicle and offer. Please look for user reviews, experiences in magazines, websites. 7. Negotiate with dealer for a better price and Calculate the on the road price. 8. Look for the best finance and insurance option Tips for selecting a car Look for the quality and brand image than choosing a car with attractive incentives and rebates. Be careful of hidden conditions in offers and rebates. Check the features and quality of the car and what all accessories you will be required to pay Check for factors that are important to you such as mileage, service network, and safety. A comparative study with other vehicles will help Analyze the engine power, seating capacity, mileage, and other technical specifications. Ask for incentives the manufacturer is offering. Enquire about extended warranty or service contract. Automobile insurance is a must, review insurance policies from various insurance companies to make the right choice. Check with insurance companies before you buy your new vehicle; compare these insurance rates to make the right choice. New Car Discount Negotiation Guide Car manufacturers and dealers offer different t y p e s of d i s c o u n t to a c u s to m e r. Understanding these discounts will help you bargain with your dealer. If you are smart enough you can get a discount of up to 10% of the price and in very rare cases even more. The discounts vary according to the manufacturer and demand of that particular car in the market. Dealer/OEM Discount: This is a sales promotion offer directly from the manufacturer or the dealer. This offer is usually not available on news cars and cars with long waiting period. You can expect the dealer to give 1-5% discount without bargaining and if you bargain he would give a little more. For some cars which are not selling that well the discount will be as high as 10-15% Corporate Discount: Car dealers offer a discount called corporate discount for employees of a corporate, governments etc. this is done attract more buyers for the Car. Please confirm your eligibility with the dealer. Loyalty Bonus: is a type of discount given to retain their existing customers. That is in case you already own a car from the same manufacturer. Normally loyalty bonus is quite handsome and can range up to 20,000 rupees. Exchange Bonus: If you are trading-in your existing car for a new one at the dealership, ask the dealer for an exchange bonus. Dealer happily offers exchange bonus because he gets a good margin on your used car that he buys. The exchange bonus should be in the 15% range. Discount on Other Charges: Lastly you can ask the dealer a discount on other charges like registration charges, handling charges and service charge. challenges that call for radical policy changes. years, our lifespan had increased dramatically. would advance by another 10 years. declining percentage of working population. discriminate on the basis of age. until a fullblown crisis is at hand. supported by a shrinking base of the working population. years in retirement than their working years. we wait until a full-blown crisis is at hand. to adjust to the new realities. Therefore, let traditions remain where they are, but let our mind-sets change. If you are asked to qoute the best experience of your life till date, what would it be? • How was it when you first faced camera in your life? • How was it working with the heartthrob of malayalam film industry Fahad Fazil? First time I ever faced camera was for a television reality show the big break. Then I was more worried about the telecast rather than the shoot. He is a cool dude, we will feel an ease when we work with him, he never make us feel that we are actually acting. • Your entry in to the film industry. • Any close friends in the industry? As I mentioned, everything started from my mini screen appearance. That show carpeted my way towards the film Shutter a Joy mathew’s film which is yet to be released. It was after shutter I did 22FK . Ashiq Abu is gem of a person, a real good friend of mine. • Your thought about the film industry. Industry is just like any other work space, what matters is the way you are and the way you conduct yourself. • More about your debutant film. Shutter was indeed a great experience. Sharing same screen with the mastreo Lal was an overwhelming incident. It was Lal sir who refered me for 22fk. • If you are asked to qoute the best experience of your life till date, what would it be? Working with the great Akshay Kumar in malapuram gold ad shoot was just an astonished event in my life and being a debutant I find myself charmed to get an opportunity like that an opportunity for which many talented girls must be thriving out there. • How can you deascribe yourself in two words? Daring and reserved. • 22fk Tissa, that’s how you are more known these days. How different is she from Riya the real you? • We are all well aware of your acting caliber, what are your interests other than acting? Riya is a temperate face of Tissa, to tell you the truth there are no much evident differences between us. Well, I’m a literature student at times I find myself comfortable with books. Then most of the time with friends and family hanging out in Kochi. • Can you recall any special moment from the set of 22fk? My first shot in the film was with Reema, she is a well experienced actor, on other hand it was me at the shivering end. But she really helped me out to bring out the best in me right from my very first shot. My first shot is something totally unforgettable. • What are your future plans? Always wanted to be in films, so planning to be in the industry and live my life the way I want it to be. • Who do you consider as your supporting pillar? My mom has always been my title of inspiration, and she is the strongest pillar one can ever get and I find myself blessed with a good fortune to have her in my life. olkata, formerly spelled Calcutta, is the capital of the Indian state of West Bengal. It is located in eastern India on the east bank of the River Hooghly. The 'City of Joy' is the most apt place for the eager visitants as the places of interest in Kolkata are numerous. This eventful city with its many marvels has truly a lot to offer. Since its birth in 1960, it has metamorphosed into one of the most sought after destinations for the tourists from all over the globe. Kolkata is indeed a happening city and when it comes to entertainment in Calcutta, the city of joy has a lot of choices to offer. Kolkattans are very talented people and have an artistic flair. Calcutta is in fact very famous for its cultural activities then be it theatre, music, dance, art or poetry. There are so many religious places to awaken the holy and divine side of an individual and instill feelings of peace and harmony in him. Kolkata is known for its vibrant, vivid, joyful lifestyle and hence it is widely famous as â&#x20AC;&#x153;city of joyâ&#x20AC;? nourished from ethnic culture, various traditions and living of the natives which directly impacts the lifestyle standards of the localities in the capital city, Kolkata. As being the cultural city also Kolkata, offers a lot of entertainment leisures to its residents that leads to various cultural events and festivals to know the customs and traditions efficiently. The city has lots of big markets, shopping places, Bars, Pubs, hotels, various cuisines which can definitely change the buds of taste of anyone, apart from these the city has ancient and contemporary art galleries, clubs, theatres and outwards spots where one can go and enjoy. Capital city Kolkata is a home of Bengalis who are best known for their unique sensibility, for whom every activity is a joyful commitment whether it is a carnival or a festival. The Bengalis know how to bring the joy and makes the city proud of having its delightful dwellers. By Air: It is completely accessible by air. There are a number of domestic airlines that connect Kolkata with other major cities of India like Ahmedabad, Bagdogra, Bangalore, Bhubaneswar, Chennai, Delhi, Guwahati, Hyderabad, Jaipur, Lucknow and Mumbai. By Rail: There are super fast trains like Rajdhani Express and Shatabdi Express that join Calcutta from Delhi and other nearby places. Calcutta consists of two major railway stations; one is located in Howrah and the other at Sealdah. By Road: The city of joy is well linked with almost all the cities of India by road. The Esplanade Terminus is the main bus terminus that lies in the heart of the city. The latest development is the starting of DhakaCalcutta buses, which are fully airconditioned and also very comfortable. The place has been sanctified by the stay of Swami Vivekananda and most of the monastic disciples of Sri Ramakrishna who spent several years here. illuminated like a bejeweled bride. Soft music is piped which makes for a transcendental experience. Armenian Church of Kolkata This church is situated in the Armenian Street, at the north-west corner of Barabazaar, close to the Howrah Bridge in Kolkata. The internal walls of the Armenian Church of Kolkata are ornamented with marble, while the overhead gallery has mural tablets. The altar possesses a cross, the gospels and 12 candlesticks depicting Christ and his Apostles. Three oil paintings 'The Holy Trinity', 'The Last Supper' and 'The Enshrouding of Our Lord' - by the English artist AE Harris add to the glory of the altar. Ruins of the Armenian cemetery are there in the church premises. Nakhoda Mosque The Mosque is located in Jacquaria Street, near the junction of Chitpore Road and Mahatma Gandhi Road in Kolkata.The gateway of the mosque resembles the Buland Darwaza at Fatehpur Sikri. For its construction granite stones were brought from Tolepur. Inside the Nakhoda Mosque there is a fabulous exhibition of ornaments and art. The Raj Bhavan The Raj Bhavan was built as the Government House by the Marquis of Wellesley, then Earl of Mornington, Governor General of India, under the East India Company.The total area occupied by the Raj Bhavan is 27 acres. The Raj Bhavan building has 84,000 sq.ft of floor space. FAMOUS MUSEUMS Indian Museum Indian Museum is the largest museum in India. The museum was established in 1914. The museum has 6 sections-Art, Archeology, Anthropology, Geology, Zoology and Industry (Economic Botany). Birla Academy of Art and Cultural Museum: Birla Academy of Art and Cultural Museum holds regular exhibitions of contemporary Indian painters as well as sculptures. It is one of the foremost museums in Kolkata. Ashutosh Museum of Indian Art Ashutosh Museum of Indian Art is one of the museums in Kolkatawhich is dedicated to the history of the Bengali speaking peoples. Basalt sculptures from the Pala and Sena periods with a distinctive blend of Hindu and Buddhist design styles are exhibited at the Ashutosh Museum of Indian Art. The museum also houses an extensive collection of patachitras or painted scrolls from Bengal, playing cards, palm leaf manuscripts and ritual objects of different eras in Bengal's history. will spool down at fullest pace. If you are not of that nerve, try out the Magic Carpet and the Cave ride, distinguished features of the craziest amusement parks in Kolkata. Science City The park serves as an infotainment park of the city. The reason for it becoming one of the most-visited amusement parks in City is the lucid exposition of scientific applications that create fun and awe both. This is a must-visit for students. The Space Theater is the main point of attraction here. Millennium Park The Millennium Park, Kolkata is located strategically on the banks of River Hooghly and in the vicinity of BBD Bagh, probably the busiest location in the city. the park is brilliantly connected to almost all corners of the city by the traffic that flows through the Strand Road. The park is attended by thousands every year and has come up fast as a major tourist attraction of the city.The park allures the visitors with the array benches on the riverside and enjoys the exquisite sight of the dark green river and the riot of the colors on it. The soothing breeze provides the healing touch to the rustic mind and the buzz of the crowd and the numerous birds creates magical environment in which one can easily lose his senses and submit himself in the hands of nature. The sunsets at the park are its special features with the golden hue of the setting sun creating your personal backdrop. The sight of the Howrah Bridge laying aside the park adds the glamour to the marvelous setting. Millennium Park is quite different from other amusement parks in the city. This one is based on the fun derived from nature not the materials, which makes this one a truly special place to visit the city. Other than these gardens we can see Zoological garden,Botanical garden and Agri-Horticultural gardens which are the destinations of fun and learning for kids as well as adults. Shopping at Kolkata There is absolutely no d e a r t h of s h o p p i n g destinations in Kolkata. There are several markets which dot the cityscape offering a varied range of items. A number of new shopping Malls have come up recently promise everything under one roof. With such plenty of choices at hand one just needs to decide Where to shop in Kolkata and head straight to that particular shopping destination. Dakshinapan Shopping Complex, Kolkata is huge open-air Complex which has got two floors with a beautiful courtyard in the centre. The Dakshinapan Shopping Complex in Kolkata houses many State Government outlets which sell mostly handloom and handicraft products. Apart from these there are also many privately owned shops which sell foot wear, ethnic dresses as well as dress. The prices are also reasonably cheap. Another famous shopping place is the Fancy Market.This is a one roof Shopping Complex which houses shops selling mostly imported/ foreign goods. Household goods, glassware, clothes, shoes, cassettes, CD's, crystal ware, cosmetics, canned food products and imported chocolates are only some of the items that flood the Fancy Market of Kolkata.Other than these shopping malls,there are so many shopping spots such as New Market,Shoba Bazar,Shyam Bazar,Shriram Arcade etc. Kolkata is known for its vibrant, vivid, joyful lifestyle and hence it is widely famous as â&#x20AC;&#x153;city of joyâ&#x20AC;? nourished from ethnic culture, various traditions and living of the natives which directly impacts the lifestyle standards of the localities in the capital city, Kolkata. As being the cultural city also Kolkata, offers a lot of entertainment leisures to its residents that leads to various cultural events and festivals to know the customs and traditions efficiently. The city has lots of big markets, shopping places, Bars, Pubs, hotels, various cuisines which can definitely change the buds of taste of anyone, apart from these the city has ancient and contemporary art galleries, clubs, theatres and outwards spots where one can go and enjoy. Capital city Kolkata is a home of Bengalis who are best known for their unique sensibility, for whom every activity is a joyful commitment whether it is a carnival or a festival. The Bengalis know how to bring the joy and makes the city proud of having its delightful dwellers. The best time to visit Kolkata is October to march.Local means of transport are easily available for travelling around the city.Metro railways are also a favorable option.The park street area is famous for restaurents.Except the core of Kolkata,the out skirts are equally important as tourist centres.The tourism of Kolkata is has developed around the historical buildings and their cultural significance. Kolkata is one of the few cities,which attracts ample amount of tourists from abroad.Comparing to the other heritage places of West Bengal,Kolkata is the preferable site for the tourists because Kolkata provides pretty comfortable accommodation for the tourists. So Enjoy... The City of Joy!!! The Amul campaign tells the stories of India, a hoarding at a time. The hoardings are markers of the ‘popular’ history of India and have been followed by fans for decades. Timeless and ageless, this long-running campaign has captivated Indians of all ages. The key character in this saga is the little girl in polka dots, who helped Amul Butter win over an entire nation. This book celebrates her journey through the eyes of prominent writers, public figures and the subjects of the hoardings themselves. It contains a series of vignettes, creating a patchwork quilt of essays, snippets and selections of classic hoardings. It offers us an inside peek into the back story of the creation of the ads. Amul’s India is a celebration that would be of enormous interest to an observer of contemporary India, be it a brand manager, a management student or a fan of Amul. Or just somebody who wants a rollicking good time. You are 16, going on 17. Steve Jobs was all of sixteen when he met Stephen Wozniak. What resulted was Apple. When Sergey Brin and Larry Page met at Stanford, they were in their early twenties. They were soon to start Google. With Bin Laden dead, Pakistan threatened by internal power struggles, relationships between the United States and Pakistan at an all time low, and as the US and Britain begin their withdrawal from Afghanistan, what are the possibilities and hazards facing the world's most unstable region? Where is the Taliban now, and how do they figure in the future of Pakistan as well as Afghanistan? What does the immediate future hold, and what are the choices that Pakistan, Afghanistan and the West can make? These are some of the crucial questions that Ahmed Rashid takes on in this follow up to his acclaimed Descent into Chaos. Rashid correctly predicted that the Iraq war would need to be refocused into Afghanistan, and that Pakistan would emerge as the leading player through which American interests and actions would have to be directed. From financial crises to the woes of householders, from political instability to rampant corruption, Laxman’s Common Man cartoons capture the entire gamut of contemporary Indian experience. This special collection featuring the hundred most memorable Common Man cartoons of all time is a tribute to India’s best-loved cartoonist and one of the most striking voices commenting on Indian socio-political life. Today’s teenagers are our smartest generation yet. They are tomorrow’s entrepreneurs, investors, managers, policy makers, watchdogs and of course, consumers. But do you know what the corporate and business world is all about? How do businesses touch everyone’s lives? What really makes an entrepreneur tick? How does the engine of a company run? Who is a social entrepreneur? If you are curious, come join Subroto Bagchi and a group of smart teenagers on their exciting voyage of discovery, and in the process, get yourself a teen MBA! Business Model You (BMY) is being produced by the same five-man team that created Business Model Generation and employs the same reader-driven, online community membership model. Where Business Model Generation (BMG) taught managers a unique and powerful way to summarize any business, and any business model, on a single sheet of paper, Business Model You! (BMY) teaches readers how to draw "personal business models" that clarify the essence of their work -- and reveal new career and life possibilities. Almost every important speech that Sangma delivered in the LokSabha and the RajyaSabha has been incorporated here. Also included are his rulings as the Speaker, LokSabha, the speeches delivered by him at national and international conferences and seminars, and his midnight speech in the Central Hall of Parliament on the golden jubilee of India’s Independence. These speeches reflect the vision and the concern of an eminent parliamentarian for the development of the country and its citizens, and give an insight into the working of the world’s largest democracy. Economic Survey 2011-12 identifies growth and price stability as the major challenges of macroeconomic policymaking. The Indian economy grew by 6.9 per cent in 2011-12, after having grown at the rate of 8.4 per cent in each of the two preceding years. However, the Survey underlines that by cross-country comparison, India remains among the forerunners. It argues that with agriculture and services continuing to perform well, India’ slowdown can be attributed to weakening industrial growth. This year’s Survey has, for the first time, a chapter on India and the global economy, highlighting India’s role as a constructive player in the evolving global order. The most authoritative reference on the subject, this encyclopedia covers classical, folk, film, and other musical forms in India. Providing an overview of the historical and cultural contexts of the musical forms, instruments, and composers among others, this encyclopedia includes contributions from leading scholars and experts from all over India and abroad. In addition, this text includes historical information on the music of India’s neighboring countries, the influence of Western music in India, and the prevelence of Indian music in popular drama and film. All the stories from Revolutions to Fairytale on 12th main depict life changing situations of different people. Anjum Hasanâ&#x20AC;&#x2122;s new book Difficult Pleasures is a collection 13 stories where the common thread is that every story has an unexpected ending. The stories are all set in different cities, like Bangalore, Shillong and other major cities. The cities are vividly narrated and even clearly narrated are the characterâ&#x20AC;&#x2122;s thinking which seems to be universal. The character narration is very impressive. the uselessness of life. The reader will get a very different view on life, its needs, pleasures and sufferings. Perhaps the best aspect of these stories is their restraint. The stories in the collection can be compared with classical short stories. The very interesting ones I can suggest is Good Housekeeping, Immanuel Kant in Shillong and Revolutions. Some stories have incidents which fill us with grief. The pathos the character undergoes which becomes the turning point. All the stories from Revolutions to Fairytale on 12th main depict life changing situations of different people. Sometimes it is for a child like Neel, sometimes it is Science and sometimes for an old professor. Anjum Hasan has to be appreciated for her simple writing conversations that weave the stories together. She writes in an unpredictable but true to life manner. All stories in the collection are interesting and do not lend any dull moment. The reader will get entangled in the story telling. The apparent sorrow in most of the stories is but purging. Difficult Pleasures give a good reading experience. A tender romantic life can be tough for a man who teaches occasionally at a college for a living and lives in a tiny flat with nothing much to 'sacrifice'. Arike has a simple stor y with an uncomplicated plot. But it’s Shyamaprasad’s skill that makes the movie a delight to watch. He has always delivered great movies. This cannot be considered his greatest but certainly it is directed with great skill. The movie is about three young people who are very different from each other. The characters can be found in the people around you. The actors have done a great job and subtle emotions are conveyed very beautifully. him. Usual reasons like cast, status and money comes into play. Kalpana stands by Shanthanu and they plan to get married secretly in a register office. Shanthanu is running around to buy a good flat for both to live. Kalpana seems to very aggressive in her commitment but in a turn of events she makes a complete u-turn leaving Shanthanu helpless. Anuradha is also surprised at Kalpana's decision but she has one more duty to convey the marriage news to Shanthanu. The movie revolves around Shanthanu (Dileep) who has a small job. He used to teach in college where, he fell in love with his student Kalpana (Samvratha). Kalpana comes from an aristocratic Brahmin family all the family members are very concerned about Kalpana. Anuradha (Mamta) is a common friend of the lovers, a lecturer in a college who helps Shanthanu and Kalpana meet. She even writes love letters for Kalpana. Mamta shows her talent in acting right from the beginning. She has a great respect for Shanthanu and Kalpana as she thinks that they are in true love. Anuradha’s respect for her friends also comes in the light that she has unpleasant memories of her first love. The film has a soul which many films today are lacking. The characters are the one you and me find in our everyday life. The problems are very real. Shanthanu depicts any ordinary man, helpless when the love of his life dumps him. He tries to find some solace in philosophy, but ultimately want someone else to take the place of Kalpana. Mamta has done extremely well in her role as Anuradha. Samvratha enacted with fiery Kalpana very well. Innocent, Chitra Iyer, Ajmal, Urmila and all others do justice to their roles. Madampu as Guru, brings in some lighter moments to an otherwise serious movie. It is but Mamta who as Anuradha makes a brilliant performance. A simple movie, but very different from usual flicks, puts the common man at the centre stage. are constantly kept up to date about the status of their flights. The services can be tailored made as per the requirement of the passenger. Three types of services are offered – Just Check out, Feel Safe and Royal Welcome. It can be daunting to arrive in a new country. Not so when you have a warm and friendly smile ready to meet you at the airport and welcome you. It takes the hassle out of traveling and helps one enjoy the benefits of a professional Meet and Greet service. Whether you are flying away on a family holiday, or are heading on a business trip, you can relax and travel in style with CIAL’ s Meet and Greet service. Majority of people are too busy providing for their existence in varying degrees. In the process they tend to ignore the fact that man cannot exist in this world alone. The long term survival of man on this planet is possible only if he can keep the life sustaining environment on this planet intact. It is important to realize that our life depends on the overall well- being of the fragile eco-system on earth. The very foundation of such inter-dependence is our environment. The factors that stabilize the environment are complex. It involves air, water, soil, all life on earth big and small and its coexistence through co-operation and even natural conflicts. possible to contract eye diseases and skin diseases”. – Vagbhathacharyan. “High fever, diseases that cause loss of weight, eye diseases, and a variety of sexually oriented diseases can be spread from person to person” Susruthacharyan. Disease causing germs are microorganisms. These organisms usually attack quite unexpectedly. According to Ayurveda it first appears as disease symptoms and subsequently it manifests its side effects. Susruthacharyan has stressed the role of micro-organisms in the causes and spread of contagious diseases. Air Pollution: Air may be polluted in so many different ways. The following are some of the indicators. Untimely seasonal changes, totally still atmosphere, very fast wind conditions, extreme heat, extreme atmospheric conditions, harsh wind which makes noise, obstructions in the flow of air, air contamination by poisonous fumes, humid air, dusty air, air filled with fumes etc. Diseases caused by polluted air. Poisonous fumes mixed in air can tire birds and even kill them. For human beings the same can cause nausea, headache and acute eye diseases. The changes in season can also bring changes to the quality of water. Pure water is tasteless, light and clear. alien to the white men. For the native Indians earth is their mother, and they have a deep abiding respect for nature. Causes of impurities in water and the diseases born as a result. earth from serious ultra violet rays. Melanoma of the skin and other cancers are on the rise due to this. According to Swatharopanishath the divinity in nature and in the heavens which is trees, are being destroyed by the evil forces. It has now become a reality all across the world. Pollution kills human beings. The famous scientist Aldus Faxali in his writing states that deforestation is just like a nuclear bomb that can destroy cities. Likewise soil erosion can kill the motherhood of city life. Industrial waste seeps into the ground and pollutes drinking water, while reducing its natural flow. 2/3rd of all patients admitted into our hospitals are victims of contaminated water related diseases. It is a shame, because we are known to have an abundance of pure water. If we don’t take environment protection seriously, our food, drinking water, atmosphere, light, air and even rivers will get poisonous. Even rat fever, malaria and many new diseases are the result of unhealthy environment. Contagious diseases are steadily on the rise these days. Jaundice, hepatitis-b and aids are good examples. The time has come to explore the possibilities with Ayurveda to help overcome these contagious diseases. When prevention is failing everywhere, we could now focus on cure. When we see outbreaks of contagious diseases we s h o u l d u n d e r t a ke g o v e r n m e n t approved involvement, like the allopath system does. It is time we started Ayurveda medical camps that can conduct relief programs. Unfortunately, at present such initiatives are the monopoly of a certain system of treatment. Selfishness and greed are now ruining the health of man and the environment. The indiscriminate use of contaminants in milk, fruits, vegetables, meat, fish, the health hazards of colas, sweets, artificial coloring in food, additives like aginomotto etc. should be made aware to the public. If we continue on this destructive path we are traveling now, the next generation is sure to suffer serious consequences, and we will be held morally responsible! Q. How can I tighten sagging skin on my face? Good question with a cost-effective answer: egg whites. Whip up an egg white and brush on face. Let dry 15-20 minutes. Spritz on water to soften and then wash off. I would suggest getting a couple of ice cubes, and with circular motions, rub the ice cubes all over your face. You will be refreshed and look like you had an expensive facial procedure. Follow with a good moisturizer. Q. Can permanent tattoos cause skin cancer? If I am preparing for an occasion, when should I get a permanent tattoo done? swim, gym, expose yourself to direct sunlight or apply soap during that period. Make sure you follow other care instructions given by your tattoo artist. Q. Can hair colour cause premature greying? If you have a tendency to grey, then hair colour may trigger further greying, but not otherwise. Bad quality hair colour may damage your hair, so choose good quality, ammonia-free ones that are safe and effective. These leave your hair looking shiny and healthy. Samsung Galaxy S III Samsung Galaxy S III is the most awaited phone in recent times. After it was unveiled in London in mega event in London fans have been waiting for the phone to hit the market. It will be soon available in India. Most probably while you are reading this article, the phone will be available in Indian markets. Exact prices are not known , but is said be above 40,000 ruppes. tight clothes’, it’s just low class ladies, wear clothes that are just the perfect fit or just a tad loose. For those who are very skinny, if you wear skin tight jeans, it’s better because as mentioned earlier it will make it seem as if you have a little meat on you in comparison to wearing lose clothes. Men the perfect fit concept is applicable to you as well, just remember not too loose or too tight. When it comes to wearing tights for girls, always have a pair of black tights’ and white tights in stock, since you can mix n’ match them with any tops. When it Comes to Accessories Girls that are chubby do not use big accessories like big necklaces, earrings, or purses or too much jewelry it makes you look overloaded! Always be simple. It’s more sophisticated. Girl’s that are skinny, use necklaces, earrings, and other accessories which stand out. Either way make sure none of the colors clash, that doesn’t mean to make the colors all the same, mix the colors, and make sure that there’s contrast between combinations. Shoes, Shoes, Shoes! Now when it comes to short people, learn to take pride in the fact that you are short, because God made you short. After coming to terms with the fact that you are short (which is the whole admitting, and loving yourself for who you are step), then if you would like to do so, wear heels. If you don’t want to then don’t, it’s your choice, you’re beautiful with or without them. Moving onto tall people, you can avoid wearing heels you’re already tall enough, and on top of that to wear heels to make yourself look taller is just…plain wrong. Think of the short people, have compassion, but if it’s a must on heels then please feel free to do so. Just keep in mind short or tall, heels will later on be of a consequence to your health so don’t wear it religiously. Another thing for the adults is what’s with the sneakers, and jeans combo? When you wear jeans, and skirts wear beach sandals. Leave the sneakers for the days when you work out. It throws off your whole outfit. dream job. Steve jobs had dreamt of designing an iCar before his death. Apple board member Mickey Drexler revealed this news. Jobs didn’t actually design it, but everybody now wants to know how it will look like. Various creative of the iCar are now showcased on the web. According to Drexler, he used to design all sorts of stuff in his hospital bed. Speaking at Fast Company's recent Innovation Uncensored conference, Drexler expressed sadness at the current state of automobile industry in United States. "Steve's dream before he died was to design an iCar" he added. connections between those entities. Users who search for a person, place or thing already in Google's knowledge graph will see a panel on the right side of their search results that offers a summary of the most basic information about that query item. For instance, a search on the American architect Frank Lloyd Wright will deliver basic biographical data as well as links to particular buildings he designed. It will also point to information about similar architects. The new search format is intended to improve Google's "time to result" performance, said Wright. The knowledge graph already returns answers to almost 40 percent of the questions users would otherwise ask next, she said, meaning users can get the same information with fewer clicks. Microsoft has opened up its So.cl, a social networking service to the general public, which help users share and comment on interesting search results and connects with similar minded people. The product is targeted at students and earlier was limited to universities and schools. Microsoft said that the product was developed by its Fuse Labs unit as a research product. Members can create collages of content using Bing search engine technology and share it with others. Like minded people can then be identified added into the group. Users can sign up with facebook and So.cl is placed like an experiment and not as a competitor. Members can sign in using their Facebook login details; however, their So.cl activities do not show up on Facebook's pages unless the option is activated. Will you get a million likes if you add a life event in your Facebook Timeline? No. But ask Facebook founder and CEO Mark Zuckerberg, he will have a different answer. Mark married Priscilla Chan and updated his timeline on May 19, 2012. A picture of the newlywed, the bride in a white gown and Mark in dark suit and tie with a description ‘Married Priscilla Chan’ got over a million likes in Facebook. Another breakup story; this time not from Bollywood, but from the Auto industry. Italian auto major Fiat has decided to take over the control of distribution of Fiat Cars from its joint venture partner Tata Motors. After a lackluster period of falling sales Fiat is going to set up a separate company that will assume responsibility for all the commercial and services activities from the current team. 26 year old, Israeli supermodel Ban Rafaeli has been crowned the world’s hottest women by men’s magazine Maxim in their 2012 Hot 100 list. Ban was ranked 19th in 2010 list of Maxim. Olivia Munn came in second place for the second time in a row. Other names in the top five list are Mila Kunis, Singer Kate Perry and Olivia Wilde in third, fourth and fifth position respectively. Sharon Stone’s former nanny is suing the actor, claiming racial abuse. Erlinda Elemen was fired by Stone in February 2011, as she found her nanny had wrongly been paid overtime. In her complaint she accused the actor made a number of disparaging comments about Filipinos, She also accuses that Stone criticized her for frequently attending church and even reading the Bible and ordered not to talk Stone’s three children. Saif Ali Khan and Kareena Kapoor are reported to get married in October. If the reports are true it won’t be just Brangelina wedding, which will be a high profile celebrity wedding happening this year. Kareena Kapoor is said to be busy finishing her assignments before October. Apart from the much hyped film, Heroine, Kareena is said to appear in Sanjay Leela Bhansali’s film Ram Leela. Ashley Rebello, the famous fashion designer said that today’s celebrities are very knowledgeable when it comes to fashion, especially the ladies. He even pointed out that the kind of fashion awareness that someone like Sonakshi Sinha has is incredible.